1. 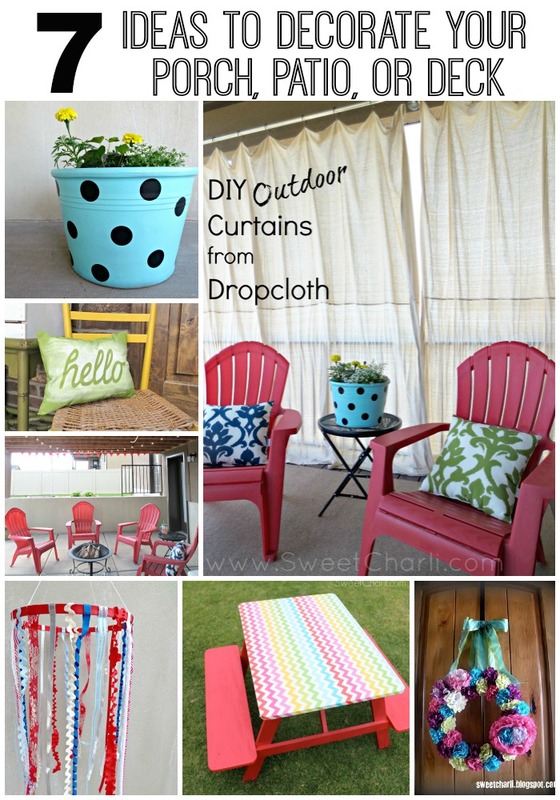 Outdoor curtains made from drop cloth. This is the single best thing we have done with our deck. Our house faces North a and our deck gets the West side sun just in time for our BBQs. We never used our deck until we put these curtains up. It only took us a few hours and has been so worth it! 2. “Hello” pillow. This pillow is so welcoming and also very cute! It is a great accent to greet your guests on your front porch. 3. Refurbished wooden picnic table. This has been another favorite of ours, or should I say, my kids! We took a weathered wooden picnic table and added some laminated fabric to the top for easy clean-up. Check out how easy it was! 4. Polka dot flower pot. How happy is this flower pot? You can update a pot you already have just by adding some vinyl polka dots! 5. DIY outdoor banner from reusable grocery bag. If you are having a party then be sure to make a cute banner! This one is made from a reusable grocery bag from Target so that it can stay outside and not get ruined! Oh, don’t forget about stringing the cute lights too! 6. Tissue paper flower wreath. This was a big hit on the blog a few years ago. It is so happy and fun and what is so great about it is that you can create it using any colors you wish! 7. Ribbon wind mobile. You can get creative and use whatever color combination you would like for this. When it moves back and forth in the wind, it looks so cute! I used red, white, and blue in this patriotic wind mobile. Well there you have it! Some of my favorite ideas for my porch, patio, and deck. I would love for you to tell me which one of these you want to make? Hope you all have a fun summer entertaining your guests outdoors! When I was young, my dad wanted to lower the back deck, so I could roll my wheelchair outside. First, he lowered the deck planks, then he pushed them together to remove the gaps between them that the deck was originally built with. It was a really fun project to watch.